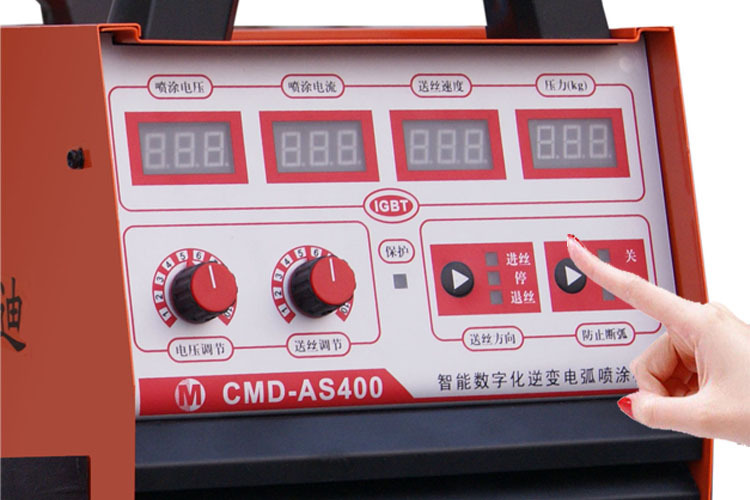 CMD-AS600 Intelligent Digital Inverter arc spray machine can spray Φ1.0-3.0mm wire of zinc, aluminum, stainless steel, hard chrome spraying, molybdenum, copper, nickel, nickel chromium alloy. It is suit for large area of anticorrosive engineering, mechanical parts repair and rapid recovery size, all kinds of mould, wear-resistant coating, and production of decorative coating parts repair. The principle of arc spray is using arc as hot source to atomize the melted metal wire, spray it to the surface of the work piece in high speed and then form a spray coating. CMD-AS600 Intelligent Digital Inverter arc spray machine can spray Φ1.0<?xml:namespace prefix = "st1" ns = "urn:schemas-microsoft-com:office:smarttags" />-3.0mm wire of zinc, aluminum, stainless steel, hard chrome spraying, molybdenum, copper, nickel, nickel chromium alloy. It is suit for large area of anticorrosive engineering, mechanical parts repair and rapid recovery size, all kinds of mould, wear-resistant coating, and production of decorative coating parts repair. 1、Small size and light weight，easy to move on. Import IGBT tubes (fourth generation), high quality assurance. 2、Output voltage and current stable and smooth, strong anti-jamming capability. 4、The coating mass density is high, quality is good, porosity is less than 1%. 7、flexible operation, arc spraying width can be fine-tuning. 8、High efficiency and energy saving, low consumption, power saving is 55% than ordinary arc machine . High power factor：up to 0.9. 9、A variety of options: wire drawing, wire pushing, wire drawing and pushing type, Spray inner wall of pipes φ>50. Spraying aluminum Replace the hot dip aluminum, Large area of anticorrosive coating.